RESTAURANT AND FOOD delivery chain Camile Thai is bringing its ‘virtual brand’ Slammin’ Ramen to Dublin six months after first testing the concept in London. The ramen-based spin-off will not have a physical location. Instead, meals will be prepared and dispatched from one of Camile’s existing kitchens when Deliveroo users order from the ‘virtual’ restaurant. Camile founder Brody Sweeney said the concept has for the last six weeks been trialled with customers with postal addresses in Dublin 4 and 6. “We were really encouraged with the business we’re doing on it. It worked so well for us in London that we thought we’ll see how it’ll go in Dublin,” he told Fora. It’s early days, but Sweeney said he’s starting to see repeat business for the virtual store coming through and that “sales are growing every week”. Since Slammin’ Ramen launched in London last summer, sales have become “pretty solid” in the UK capital, though they were slow initially. “About 80% of customers who order every week are repeat customers. When you’re getting a high level of repeat business, that’s telling you you’re on to something,” Sweeney said. He said if the business can add sales onto an existing business “without capital investment” and with the same ingredients and kitchen then it makes commercial sense. In July last year, when Fora first spoke to Sweeney about Slammin’ Ramen’s London debut, he said he was searching for locations for possible new Camile stores. Naas, Drogheda, Waterford, Maynooth, Wexford, Kilkenny and Wexford were cited on the wish list. Sweeney said those options are still being considered and the chain is planning to open seven new restaurants here this year alone, on top of the existing 14 locations. “Technically every one of those can have a Slammin’ Ramen added on to them,” he said. While Slammin’ Ramen is currently only available via the Deliveroo app, Sweeney said that once the trial period has ended, he intends to roll out the concept to Camile’s website and app. “With out own delivery, most of our sales are through our own app. We do far more on that than we do in any other way,” he said. 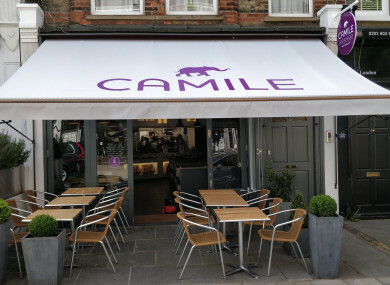 Though plans for new Irish Camile outlets are afoot, the “big plan” is for London, which has room for up to 68 branches, according to a study commissioned by the company last year. “We’re really putting a lot of effort into London and getting it right,” Sweeney said. Despite this, the company has decided to hang back on its UK expansion. Camile is one of the businesses operating out of 14 Deliveroo Editions ‘dark kitchens’ in the UK. The food delivery service recently announced plans to offer ‘virtual brands’ – like Slammin Ramen – in Ireland on the back of the same concept in London. It also announced plans to launch Deliveroo Editions here this year. Email “Thai food chain Camile is trialling its 'virtual' ramen bar in Ireland”. Feedback on “Thai food chain Camile is trialling its 'virtual' ramen bar in Ireland”.